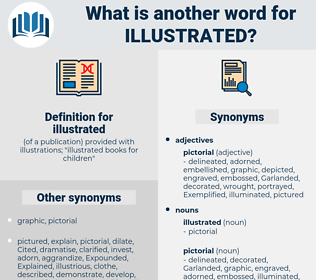 What is another word for illustrated? ( of a publication) provided with illustrations; " illustrated books for children"
articulated, demonstrated, Attributed, Indicating, Stipulated, summarized, delineated, suggested, Explained, depicting, revealed, examples, characterized, reflected, underlined, emphasised, Testified, highlight, highlighted, outlined, emphasized, Cited, attest, attested, elaborated, Quoted, established, clarified, Told, recalled, underscored, Displayed, displays, exhibit, exhibits, addressed, Manifested, Alluded, portrayed, description, affirmed, discovered, specified, signified, signify, stressed, Exhibited, Captured, Argued, proved, certify, identified, advised, conveyed, stated, showed, note, noted, taught, showcased, raised, disclosed, determined, listed, lists, evoked, imagined, bore, Introduced, Mentioned, declared, Enabled, Appeared, signalled, described, chronicle, reinforced, concluded, recounted, informed, Submitted, uncovered, presented, reported, Invoked, Transpired, pointed, Referred, expressed, Relied, Discussed, Exercised, Supplied, Expounded, Emerged, Filed, Seemed, led, conceived, spoke, Provided, said, mirrored, Succeeded, Dealt, charts, Envisaged, Commented, echoes, touched, Brought, set, unfolded, exposed, shared, evidence, turned, Accounted, added, Gave, found, called, put, Meant, voiced, Looked, making, made. 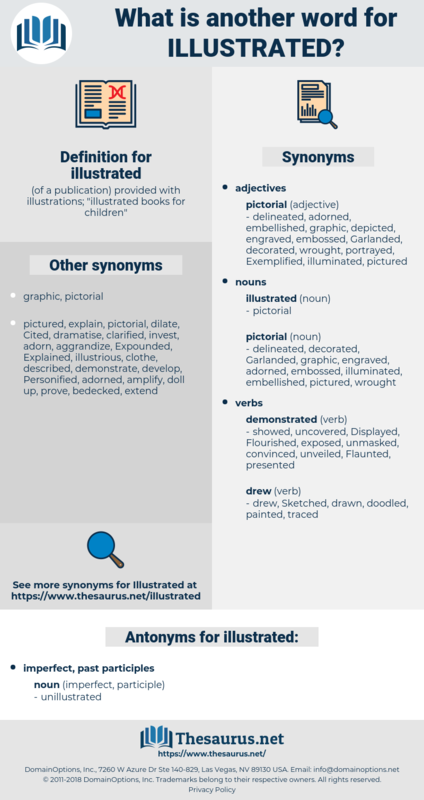 illuminated, articulated, demonstrated, Attributed, substantiated, indicate, Replicated, Elucidated, Translated, summarized, delineated, validated, suggested, Explained, depicted, regulated, incorporated, revealed, examples, materialised, characterized, designated, reflected, Duplicated, facilitated, demarcated, underlined, Enumerated, emphasised, asserted, highlighted, outlined, realised, emphasized, detailed, Cited, Materialized, attested, elaborated, Quoted, ascertained, measured, altered, established, clarified, represented, located, Resulted, Told, formalised, Enunciated, Arisen, underscored, Communicated, Displayed, addressed, nominated, Manifested, realized, formalized, portrayed, discovered, specified, disaggregated, ruled, example, impressed, Discerned, stressed, Caught, finalised, learned, Learnt, Exhibited, confirmed, proven, Captured, instructed, furnished, donated, Argued, reprinted, derived, certified, proved, Heightened, identified, witnessed, advised, delimited, stated, showed, Tackled, artwork, note, noted, implied, taught, acknowledged, briefing, briefed, embodied, manifesto, perceived, showcased, raised, disclosed, Borne, determined, listed, directed, entrusted, supported, evoked, Introduced, Mentioned, printed, declared, Underpinned, verified, Enabled, Appeared, demonstrable, Signaled, signalled, described, buttressed, pictured, reinforced, contained, informed, fulfilled, Submitted, uncovered, unveiled, Photographed, included, Delivered, useful, arranged, presented, reported, Invoked, Transpired, conspicuous, tested, refer, pointed, enclosed, Referred, reproduced, proof, Helped, Enshrined, permitted, expressed, table, tabled, risen, sampled, matrix, Discussed, defined, Exercised, used, Profiled, Expounded, foreseen, Emerged, Filed, referenced, applied, Reared, Yielded, spoken, Comprised, covered, awakened, Remitted, prescribed, led, pursued, Adduced, warranted, Provided, said, Singled, mirrored, Dealt, honoured, photo, drawn, Evinced, accompanied, checked, felt, recorded, observed, shot, noticed, framed, Contended, detected, heard, Offered, broached, touched, Brought, set, Screened, Viewed, graph, exposed, shared, evidenced, Claimed, seat, evidence, turned, documented, Entered, see, seen, marked, posed, Been, Lived, Notified, bound, patented, Accounted, inscribed, given, cf., Talked, paid, Audited, day, filmed, Performed, found, sponsored, copied, Flexed, bordered, sync, Allowed, Lodged, Approached, voiced, Worded, Amounted, Looked, packed, backed, bounded, shed, figured, done, made, named. The principle illustrated in this article might be pursued; but the secret history of two great works so well known is as sufficient as twenty others of writings less celebrated. He illustrated his meaning by extending his own huge paws.